What Is A Riding Lawn Mower? Who Is A Riding Lawn Mower Ideal For? What Are The Benefits Of A Riding Lawn Mower? How To Choose A Riding Lawn Mower? What Size Riding Mower Do I Need? What Are The Different Types Of Riding Mowers? What Are The Top Features Of A Riding Lawn Mower? What Are The Best Riding Lawn Mower Brands? Where Do I Buy A Riding Lawn Mower? Few tools pare down the time and energy you invest in your yard quite like a riding lawn mower or lawn tractor. Instead of walking behind a mower to either it keep pushing it forward or guide its self-propelled progress, you simply need to ride along and steer to keep your grass neatly trimmed. These go-karts of lawn care groom massive areas in seemingly no time at all. If you’ve ever dreamed of measuring the time spent beautifying your yard in frosty beverages guzzled while mowing, there is no finer way to “work” in your yard on a sunny Saturday afternoon. Riding lawn mowers and lawn tractors operate with the versatility, power and efficiency to manage the kind of upsized properties lawncare professionals are often called upon to groom. Time is money, so why sink unnecessary hours maintaining your commercial property’s lawn glued to a push mower when a riding lawn mower or tractor could cut your time investment in half? There’s only one way to maintain acres of rolling hills with professional precision, and no walk-behind mower can match the speedy cutting and dependability of a riding mower. If your body just isn’t up to a walk-behind mower any longer, even a self-propelled model, nothing will step up to any lawn measuring from ½ up to two acres quite like a riding lawn mower or tractor. No other tool around matches the time and energy a riding lawn mower’s speed, power and overall performance can save anyone from a lawn-care professional to a homeowner overwhelmed by keeping up with an exceptionally large or hilly lawn. As powerful and fast as they are, riding lawn mowers are also exceptionally safe when it comes to keeping the driver elevated above being assaulted by rocks and other debris tossed around by the blades. Here’s the only major downside: both in storage and at work, a riding lawn mower takes up some serious real estate. Yards under about a half-acre dotted with trees, flowerbeds, artful landscaping features and other obstacles are much better suited in terms of cost-effectiveness and practical use by smaller self-propelled or pushed walk-behind lawn mowers that a riding mower can’t touch for maneuverability. Though you might want to slow down here and there for better trimming, being able to move fast at any and all times especially benefits professional landscapers and maintenance workers who can’t afford any time wasted or profitability lost moving from one project to another. The more grass you can cut along any given path without sacrificing too much needed mobility relative to your lawn’s specific layout, the faster and more comfortably your job becomes. Bigger isn’t always better, but when it comes to riding lawn mowers and tractors, that’s a significant element of their appeal. If there’s just no getting around how many tricky turns you know you’ll need to manage and you can accept having a harder time with hills as a trade-off for a uniquely tight radius, stick with a zero-turn mower for deftly navigating shrubs, lawn statues, trees and the like. Given that a mower’s power varies accordingly with its engine placement, it bears keeping in mind that tractor mowers with larger engines positioned up front far outstrip zero-turn and rear-engine models for unstoppable cutting ability. A manual transmission might sip fuel more efficiently, but there’s nothing wrong with an automatic transmission that lets you focus more intently on steering while you mow, either. A regular riding lawn mower will often suffice in terms of maneuverability and overall performance to make even shorter work of a medium-sized yard than a larger walk-behind mower. Once you get up to between an acre and a half and two acres of grass to manage, a 36 to 42-inch mowing deck makes a world of difference over an average-sized riding mower, At three acres and beyond, settle for nothing less than 48 to 72 inches of cutting swath. Don’t let the outside fool you. They may look like ordinary riding mowers, but zero-turn mowers (almost literally) dance circles around any other design by pirouetting practically on the spot instead of pivoting or circling. Be advised, their knack for tight corners and sharp turns can make them difficult to handle on inclines. Top-shelf mowers move at speeds topping out in the neighborhood of 10 mph to go with their superb control and the smooth, convenient speed control of a hydrostatic transmission. They are also notoriously expensive, take up tremendous storage space, don’t offer many compatible attachments, and impose a sometimes-intimidating learning curve due to utilizing levers for steering. Much like zero-turn lawn mowers, a lawn/garden tractor doesn’t look all that meaningfully different from a typical riding mower. However, there’s an unmistakable distinction in terms of these larger mowers’ design accommodations for additional specialty attachments and overall superior power. Automatic, manual and hydrostatic transmission options and uniformly wide cutting decks enable these bigger riding mowers to take out a lot of grass in one pass and at top speeds around 6 mph, meaning greater power suited to mowing uphill and towing heavy loads. Unfortunately, that added bulk can hinder its steering in tight spots and the front engine obstructs at least some driver vision. It bears noting that a lawn tractor has an appealing adaptability owed to their sturdy transmissions’ sizable towing capacity and thresholds for steeper slopes and hard labor in exceptionally tough territory. These beasts’ larger wheels lend them the elevated clearance to trudge through rough soil and added differential locks that keep the rear wheels working together and traction control for fortified grip will prevent slipping on inclines exceeding 15 percent. The bigger your lawn, more pronounced your slopes and stubborn the grass and weeds you contend with, the more your needs favor a bigger, more powerful front-engine riding mower. There are a number of transmission options to focus that considerable extra muscle and broad cutting areas that slash mowing time. Of course, at the same time you gain extra power for hauling big loads and advancing uphill, you lose agility for moving around smaller yards. Possibly the greatest disadvantage of a front-engine riding lawn mower stems from the source of its greatest advantages: the bigger engine makes it impractical for medium-sized yards that a faster, smaller rear-engine mower can maneuver through almost as nimbly as a walk-behind mower. Having the engine in the rear also directs heat away from the driver and its gas pedal and steering wheel make its control perfectly natural. At the same time, its top speed maxes out around an unimpressive 4.5 mph and most models offer relatively underwhelming cutting-deck sizes. Since most rear-engine mowers are designed with a manual transmission, adjusting speed by hand may feel awkward while trying to concentrate on actually mowing. Single-speed riding lawn mowers cost less than multi-speed counterparts and will stand up fine to lawns without many obstacles but can prove inadequate for more complicated jobs. On the other hand, multi-speed mowers offer anywhere from two to seven speed settings that make them more adaptable to a wider range of overall mowing situations, household users, and obstacles to avoid and trim around. A riding lawn mower with a single-cylinder engine is really all you need for smaller lawns but you do have options with other fine points to consider. Although easier to move amidst tighter yards, mowers with single-cylinder engines can’t quite match the 16 horsepower or more that twin cylinders generate or their superior durability, let alone the advantageous power and balance that produces noticeably smoother cuts. Well-designed handling takes considerable strain out of any lawn-care task. A sharp or even zero-turning radius makes working around obstacles easier, but that isn’t the only consideration. The traction edge that comes with specialty tires will, if you pardon the pun, level the playing field against slick yards and sharp slopes. Nearly any riding lawn mower is going to feel more comfortable than marching behind a walk-behind mower, but even these cruisers aren’t created equal. Sound suspension calibration counts for a lot in terms making the hours it takes in the driver’s seat to mow large areas to perfection more comfortable. A single-cylinder engine might shave dollars off a price tag, but it also means a rougher, louder ride every mowing day. To smooth things out and spare your ears at least some degree of abuse, stick with twin-cylinder models. They tend to deliver dependably cleaner cuts and preferable speed and power, anyway. A well-calibrated and balanced suspension will also drastically impact how little your mower rattles while operating. Taking care of a property big enough to warrant a riding lawn mower or tractor often means starting or finishing in minimal daylight. If you have to mow before dawn or after dusk, these mowers offer bright, clear headlights to shine on your path and keep obstacles within safe view. Operating a riding lawn mower or tractor in a state of ongoing discomfort isn’t merely unpleasant; it’s a gateway to distracted driving that can lead to accidents. Look for a mower with a high-backed seat that you could likely sit in comfortably for several hours at a time. Given the size and profile of properties for which customers demand the rough-and-tumble endurance of a riding lawn mower or tractor, I wouldn’t bother with a machine that can’t pull evenly uphill without start-and-stop jostling. Commanding a riding lawn mower or tractor isn’t exactly like driving a car: in this instance, you are technically working while driving. Cruise control lets you concentrate on the job without getting sidetracked managing your speed. Two bags means half the interruptions to empty clippings. Having the sun burning holes in your eyes while shoving around a push mower is irritating enough. Atop what amounts to a go-kart or tractor with rapidly whirling blades, it is out-and-out dangerous. 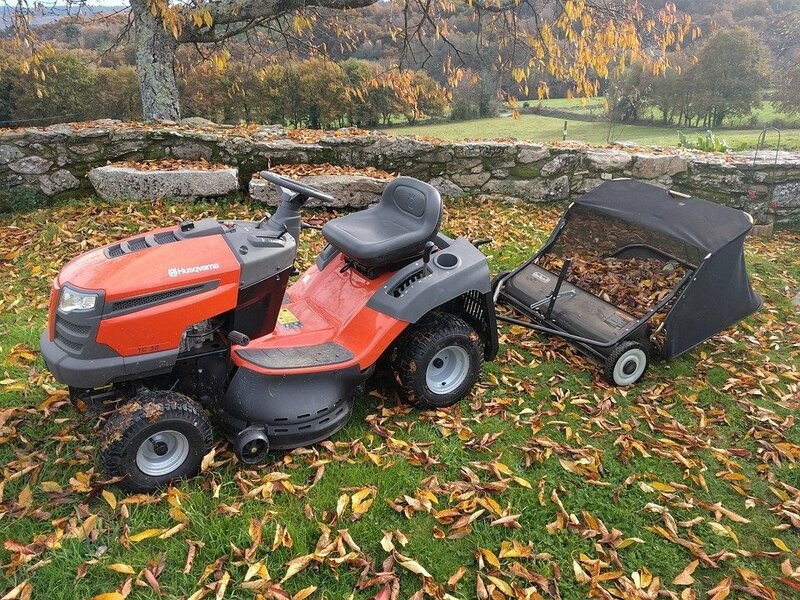 Stay safe and somewhat dry and comfortable when frosty weather calls for you to repurpose your riding lawn mower or tractor into a path-clearing machine. Dispose of your clippings the smart way: converting them directly into nutrient-rich fertilizer that spreads across your lawn while you cut. Shave time off your mowing and your day’s To-Do list by towing any additional tools you might need for jobs that happen to await on your way throughout the yard or attachments you know will come into play to trim properly in uniquely challenging areas. With a riding lawn mower or tractor, you don’t just have a grass-cutting workhorse; you also have the perfect vehicle for spraying pesticides and spreading mulch and fertilizer. Riding lawn mowers and tractors don’t have to let their usefulness falter when ordinary mowing seasons end. If you live in a region prone to being buried in snow, ice and slush several months out of the year, you can fit a number of models with snow throwers and blades to either send snow blasting out of the way while you clear a path or shove it safely aside into unobtrusive drifts. Different engines employed by different mowers create variances in speed ranging from single-cylinder engines that can rev up to around 4 mph to more powerful, durable twin-cylinder designs capable of goosing up to just over 6 mph. Though not as fast, single-cylinder engines in lightweight mowers trend toward quicker acceleration and more nimble turning but shakier stability. For the most part, you will have your choice between a clutch-based manual transmission wherein each gear translates to a different speed, a seamlessly shifting automatic transmission, or a hydrostatic transmission that changes speeds according to interaction with the gas pedal without shifting gears. It’s really pretty simple: with widths varying from around 30 inches all the way up to the 50-inch neighborhood or wider, a bigger blade housed inside a mower’s deck translates to more grass clipped with every pass and less overall time spent mowing, but often at the cost of reduced agility. Bigger tractors clear a larger path but tend to turn clumsily. For yards loaded with obstacles to trim around, a zero-turn riding mower offers unrivaled control and maneuverability by simply rotating in place to change directions. Ordinary riding mowers with relatively smaller decks will make mowing anywhere from a medium-sized yard up to around a two-acre spread magnitudes easier, but I increasingly suggest 36 to 42 inches of cutting area the closer a lawn’s measurements edge to between an acre and a half to two acres. From about three acres onward, you practically cannot finish mowing in any reasonable time without 48 to 72 inches of cutting per pass. Don’t try to save yourself sticker shock by pushing the limits of a mower with a single-cylinder engine mounted in the rear. It might add bulk and make turning several times more awkward, but a durable twin-cylinder engine positioned in front will generate significant power to take on heavy-duty mowing without faltering on cutting quality. Lawn tractors in particular offer double-tough transmissions and large wheels often paired with traction control and specially designed differential locks for added uphill-towing strength and sure-footed stability when working in rough terrain and up 15 percent-and-greater inclines. If you have an extensive commercial property to maintain and a mind geared toward the notion that time is money, a riding lawn mower or tractor is your salvation from hours wasted with your hands glued to a walk-behind mower to keep an immaculately groomed lawn. If you’re a professional landscaper, farmer or golf course owner who stakes a well-earned reputation on pristinely primping lawns of every size and dimension, the speed and versatile power of these heavyweight mowers are priceless assets to your cost-efficient bottom line. The greater size of even a standard riding lawn mower, let alone a larger lawn tractor, makes every bit of movability crucial. I could argue that it’s easy to make a walk-behind mower flexible in its ability to work in tight quarters to obstacles throughout a yard. However, there are plenty of enormous lawns out there loaded with trees and other features a rider or tractor still has to trim nice and tightly. That’s all saying nothing of the importance of being able to drive smoothly up, down and across slopes and over lumpy or wet terrain. If you know what to look for and where to find it, you can land a riding lawn mower or tractor that’s as smooth and easy to handle from behind the wheel as a push mower is by hand. An ordinary riding lawn mower’s deck will suffice for medium-to-large lawns. Starting from between an acre and a half up to two acres, upgrade to a 36 to 42-inch deck. For three acres and up of regular mowing, a deck between 48 and 72 inches is ideal. A fixed-speed mower will do for a relatively flat lawn with few obstacles, but I prefer a mower with anywhere from two to seven adjustable settings for adapting to tricky terrain, iffy conditions around me or variations in growth and cruise control for dialing into a single pace when I know I won’t need to slow down or speed up often. Between consistently dense, steady power and the ability to maintain a brisk pace indefinitely whenever possible, riding lawn mowers and tractors are capable of some remarkably crisp and precise cuts that allow grass to grow back strong and healthy without weakening its resistance to drying and disease. You certainly don’t have to mulch, but I personally like having the option of my mower instantly converting clippings into biodegradable nutrient-rich particulates and re-distributing them across my lawn as a convenient fertilizer while I driver. If mulching isn’t a regular part of your lawn-care regimen, bagging your clippings at least keeps them tidy until you can stop for a moment to empty them in a fashion that suits you. Should neither bagging or mulching your clippings appeal to you, other mowers stick with a classic side-discharge disposal that dispenses errant bits of grass in neat rows to be gathered and disposed of whenever your mowing is through. A number of current models will allow for modifying the cutting deck’s height with the pull of a lever or just a push of a button. Remember, experts advise strongly against trimming any grass below 30 percent of its overall height to avoid making it more susceptible to disease and dehydrating during hot, dry spells. Wider is not always better. Yes, you will clip more grass with every path you cut. With the exception of zero-turn mowers, you will also lose significant turning agility. They may prove more costly upfront, but mowers with multiple blades often give lawns a smooth, even surface and provide enhanced mulching with finer clippings that clump less, decompose faster, and return more nutrients to the grass. Even when bagging, the finer clippings produced by their superior cuts allow bags to hold more remnants, translating to less emptying and more time actually mowing. That’s because the lower blade follows its upper companion’s initial major cut by circulating and continuing to cut each bit of grass inside the deck into tinier and tinier pieces. For exceptionally thick or heavy grasses, upgrading to four blades will make your life far easier. Having the tightest turning radius your mower’s size will allow means smoother cutting and faster completion of the entire yard. A zero-turn mower perfects maneuverability by rotating in place to change direction, but these agile riding mowers are not without their drawbacks – namely, they come with an accompanying high price tag, a sometimes-tricky learning curve for learning to steer with levers instead of a wheel, and precarious balance on inclines. Always keep an eye on your mower’s indicator lights and attend immediately to any warnings they bring to your attention. Riding lawn mowers and tractors will alert an operator to low fuel, oil and battery life precisely because these fine machines enjoy the longest lifespans when operated under peak care with an ample power supply, a full tank, and optimal engine lubrication. Mechanics versed in riding lawn mowers and tractors will recommend regular maintenance according to the number of hours a machine has been in use. That’s why I love it when manufacturers add hour meters to their models. Knowing the usage milestones for changing the oil, swapping out spark plugs and cleaning or replacing the air filter as I do, I can glance down at that little indicator and have a pretty sound guess just what measure of TLC my mower needs and how soon. There’s no simpler way to clean the inside of a lawn mower deck: just hook the hose up to the deck-wash port, turn on the water, start the blades, and the mower practically rinses itself clean. It’s a novel way to keep dirt, debris, mud and clippings from eventually infiltrating the engine and gunking it up. When thinking about fuel capacity, riding lawn mowers and tractors fall into two categories. You have “standard” fuel tanks, which hold generally a maximum four gallons of gasoline, plenty to handle a fairly large yard. Above that, an “oversized” capacity common among commercial and higher-end riding mowers holds six gallons or even more for outsized jobs. With great power comes a great trade-off. A single-cylinder block engine keeps many smaller mowers’ costs down and provides precious speed and agile movement under the right circumstances. However, a twin-cylinder engine generates a far more balanced, smoother-running flow of horsepower, especially when mounted in the front, and will almost always outlast even the toughest single-cylinder design. It’s also hard to argue with the latter’s dependably clean cuts from the start of the job to the last patch trimmed. For smaller areas, around 16 horsepower will do just fine. Consider upgrading to something capable of around 20 horsepower for yards up to a hectare and 25 horsepower for anything more expansive than that. Personally? I find an automatic transmission is most effective for mowers that depend on a lot of movement and change speeds often. Hydrostatic transmissions produce a smooth ride very few alternatives can match. Finally, as long as you can multitask your attention effectively, a manual transmission is great for really taking the quality of your mowing into your own hands. In my opinion, a clutch is often not worth the trouble. It’s one thing to get your kicks driving a stick down Route 66, but when it comes to operating a piece of heavier machinery while maintaining your lawn, the coordination required to manually shift gears just strikes me as too much trouble for safety and the wellbeing of an (expensive-to-replace) manual transmission. I’m sure there are people out there who will adamantly argue in favor of a lever-operated riding lawn mower or tractor. Don’t count me among them. By necessity, that’s about the only way zero-turn mowers are effective. However, that also makes them harder to learn to use because a significant majority of people are more accustomed to the way automobiles and a number of other vehicles are intuitively controlled: steering by hand and clutching, braking and accelerating with pedals. It’s almost universally user-friendly, adaptable, and above all else, simple. Choose your drive type according to your lawn’s layout. Front-wheel drive is fine for easy movement on reasonably level lawns with shorter grass. However, with fairly small wheels up front powering the mower forward, it can’t compare when mowing thick, tall grass on craggy or lumpy ground to the power advantage of rear-wheel drive. Question: when exiting an automobile parked on an incline, would you think twice about engaging the parking brake? No? Then take no chances with your riding lawn mower or tractor, especially facing either way on a slope. An automatic parking brake secures the wheels as soon as you leave the driver’s seat, ensuring that your mower won’t take off on a joyride all its own. Miraculously, it’s no longer a given that a riding lawn mower has to produce a deafening cacophony of noise. Once you drive a V-twin engine engine, especially when paired with a well-engineered suspension that reduces rattling, you can’t help but notice how surprisingly smooth and relatively quiet the ride is compared to the lighter, simpler and louder single-cylinder in smaller riders. The gold-standard seal of approval for environmental friendliness among lawn-care devices is verification that a riding lawn mower or tractor is “California-compliant.” The term refers to California requiring by law that every lawn mower sold statewide display proof that its fuel system and exhaust meet or exceed the state’s uncommonly strict anti-pollution guidelines. Even a mower that just barely meets California compliance muster likely exceeds the standards for nearly every other state. For starters, clean off any and all lingering dirt and debris before starting, paying extra-careful attention to the fuel and oil intake areas. After you finish mowing, disconnect the spark plugs and battery before similarly brushing off the deck and engine. If your mower has a grass-catcher, clear away debris and inspect it for any hidden damage. If you have deck-port wash system, keep the spark plug and battery disconnected while you hook up a hose to it and start water flowing through. When ready, reconnect the power, turn it on, and engage the blades to let the mower effectively clean itself. You never know what your mower might have run over the last time you took it out for a spin. Check your tires for proper inflation and usable tread before every use to reduce the risk factors for a badly timed breakdown. After removing the mower deck per manufacturer instructions, scrape away built-up clippings lingering beneath it and clear all debris. This is also a great time to inspect the blade belt and replace it if it is cracked or worn. After either using a blade-removal tool or placing a wooden block between each blade and the deck housing to hold it in place, remove the bolt or nut attaching it. Check each blade for damage as you remove it and the attachment hardware. Sharpen the blades equally on each edge per manufacturer instructions as needed, maintaining the bevel and checking the balance of each before wiping it down with oil and reinstalling it. If this is beyond your expertise, I suggest calling a professional to take it on for a nominal fee. Always, without exception, disconnect the spark plug along with the battery before performing any hands-on repairs or maintenance on your riding lawn mower or tractor. Inspect it before and after every mowing session and replace it once a year at the start of each mowing season according to manufacturer instructions. Most manufacturers recommend changing out your oil every five hours of use. Your mower won’t necessarily drop dead instantly if you go a minute past that, but the longer you run your engine without proper lubrication, the more you grind it down and risk shortening its lifespan. Pay close attention to your indicator lights and make time to swap out your old oil when they get your attention. If you should hit something while mowing, it is important that you stop immediately to assess any damage and clear your path. Before checking out the blade, deck and engine for damage and making repairs, always disconnect the spark plug and ground the wire against the engine. After making repairs, always inspect the engine and all parts one more time before you start mowing again. Not going to lie: if you own or manage the kind of property that calls for a landscaper to swing by on one of these upsized mowers periodically to groom your grass, you are indeed missing out by not owning one and operating it yourself, if possible. Landscaping services are almost always pricey. Even if you have a fantastic deal with your current service provider, imagine not having to pay out however many times a month you need your lawn mowed. 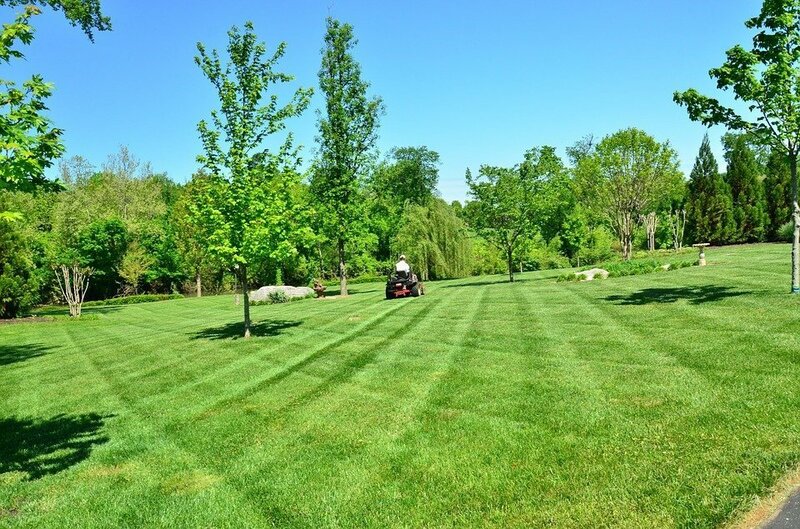 You might pay more for a riding lawn mower or tractor initially, but it’s easy to extrapolate how quickly it will pay for itself with ridiculous fuel efficiency and cost savings every month over a long working life, especially with an extra-large lawn. A handy receptacle that wrangles clippings while you wait to dispose of them. Why bag and mulch your clippings in separate steps? A mulch kit will continuously chop errant grass into biodegradable particles that your mower then spreads immediately over your freshly cut grass while you mow as a nutritional supplement. While you mow, a lawn sweeper gathers up stray debris from clippings to pine needles, leaves, twigs and the like for you to dispense with at your leisure. This handy attachment distributes chemicals, seeds and fertilizer evenly over your grass and soil while you drive. Using this attachment to perforate your soil with tiny holes will allow increased water, nutrients and air to penetrate the grass roots, helping them grow deeply and eventually producing a much more vigorous lawn. Using one of these little steamroller-looking attachments as directed will bolster your lawn’s overall healthy appearance by level and the soil establishing newly seeded grass just a bit faster. This tool breaks up excess buildup of thatch, a layer of both living and dead roots, plant stems and other organic parts between the green blades of grass and the soil that can harbor fungal pathogens and pests and also suffocate and dry out roots by blocking out air and moisture. This attachment keeps stray remnants of grass from flying every which way you don’t want them by forcing them to exit the cutting area behind you. If you could do with a bit bigger swath to speed along your mowing, a pull-behind mower can add some valuable extra width to your mower’s ordinary cutting area without having to trade up for an entire new mower. Attach a tiller to your riding lawn mower or tractor to condition your soil for any planting or landscaping task you have planned. If your terrain could use some smoothing, hook up a box scraper or grader to address its contours to your preference and even spread gravel or soil later. A raking blade will quickly collect scattered leaves, twigs and other miscellaneous debris while doing a number on thatch buildup. Whether you need to move snow, dirt or gravel, a quality plow blade will drive it anywhere. An essential tool for chopping up weeds and unwanted crop remnants while tilling your soil in preparation for planting. This multitasking attachment will prepare your seedbed by burying crop residue in the soil in order to warm it before planting, keeping weeds under control, and mixing and incorporating the soil to make way for ample nutrients and moisture to reach crops. If you have a vehicle equipped to go anywhere on your property you could need it to roam, what better way to treat your grass and crops with various protective chemicals? As the name implies, you go for a cruise around your property and this attachment layers your soil with an even distribution of rich, precious fertilizer. Again, a self-explanatory moniker: what excess remains after manure is thoroughly spread, this addition to your mower’s arsenal retrieves before it can linger and pollute your grass. This handy attachment turns your lawn tractor into the perfect tool for digging effectively on your property and moving your load anywhere with ease. Keep this accessory close by make moving longer, heavier loads across your property a breeze. The essential aid for aerators, ATVs, and other heavy equipment without having to employ a truck. When you don’t necessarily need to dig, a front-end scoop is a superb way to haul and/or spread payload such as rocks, dirt, and mulch. If you have an adjustable dozer blade and a riding lawn mower or tractor, you have the means to move dirt in the summertime and snow all winter long with equal effectiveness. Whether you live in a rural area with scant plow service or a sprawling suburb, attaching a snow plow to a riding lawn mower or tractor means never having to wait around for county or municipal vehicles to clear your road. Put the shovels away, engage this attachment, and blaze a trail through piles of snow covering your sidewalks and driveway. Any riding lawn mower or tractor can cut grass. When you add front-end rotary broom, you have a tool for thoroughly cleaning up stray debris, clippings, snow and other unwanted messes cluttering any surface on your property, from the lawn itself to driveways and parking lots. What’s better than beautifying your lawn with a leisurely drive around your property? Driving around and mowing your lawn while enjoying your favorite beverage. Keep tabs not only on the time you spend mowing, but how many hours of use elapse between regularly scheduled maintenance. Don’t settle for leaving the job unfinished just because daylight is dying. Set a single steady pace to finish your mowing in a timely manner with impressively consistent cutting quality. It’s always better to have a selection of multipurpose tools on hand and never need them than to come across a task that needs them when you don’t have them or, even worse, experience a breakdown with nothing to make repairs. Although most riding lawn mowers and tractors favor gasoline engines for optimal power, a number of models produce excellent results running on cleaner-burning and fairly inexpensive propane. I consider tires I don’t have to fear blowing out to be a huge plus, considering that these mowers are made to endure uneven, often at least somewhat rugged terrain whenever called upon. Seeing is believing. A direct window displaying the inside of your fuel tank will both tell you in no uncertain terms exactly how much fuel you have left and possibly show you any dirt or debris that might have infiltrated the inner workings of your mower. 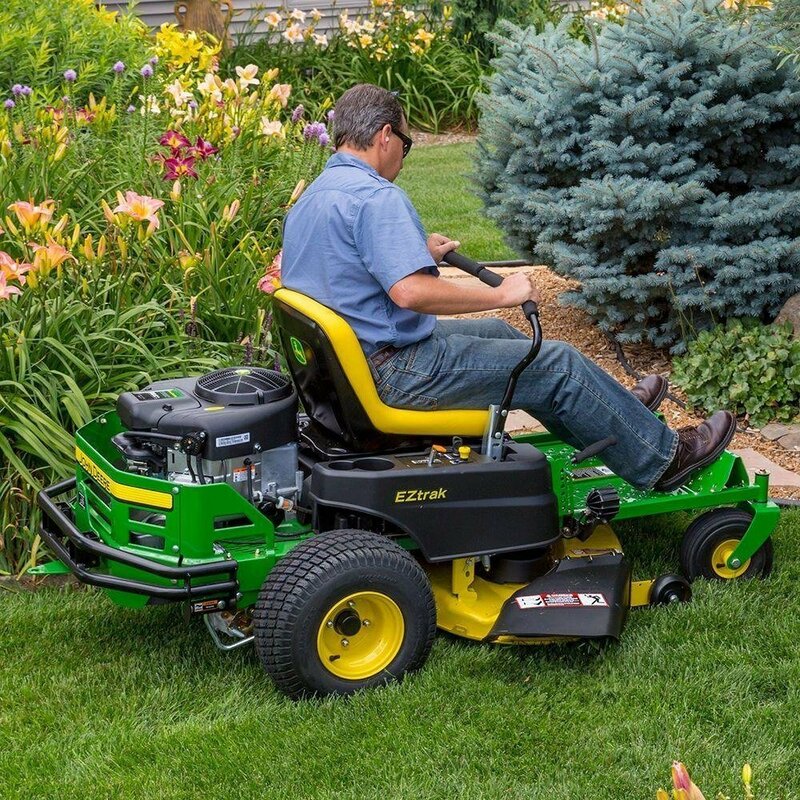 Given the likelihood you’ll spend hours at a time atop your mower – possibly with heavy vibration rumbling up your body – it’s vital that your seat take good care of your lower back while you drive. Take good care of your comfort and circulation by making sure you won’t have to angle or scrunch your legs unnaturally during a long mowing session. Since your arms will eventually tire gripping and turning the wheel the entire time, it’s nice having the option to let one or the other rest comfortable at your side for a spell. A riding lawn mower or tractor is a rugged machine built to shoulder some of the heaviest, hardest landscaping labors around. A quality model will pay for itself fairly swiftly over years of dependable service by foregoing paying a professional landscaper to use the exact same machines to perform the same duties. That doesn’t mean it won’t occasionally need some TLC to uphold such a significant investment. A two-year manufacturer warranty is the lower end of the industry standard for dedication to repairs and service. I would strongly advise looking for at least a three-year warranty with clear terms and conditions. Even better, a four-year plan with few clauses that narrowly void manufacturer accountability is the true high point of guaranteed quality. You get a basic riding mower with fundamental features, enough to handle an ordinary yard without any fancy extras. 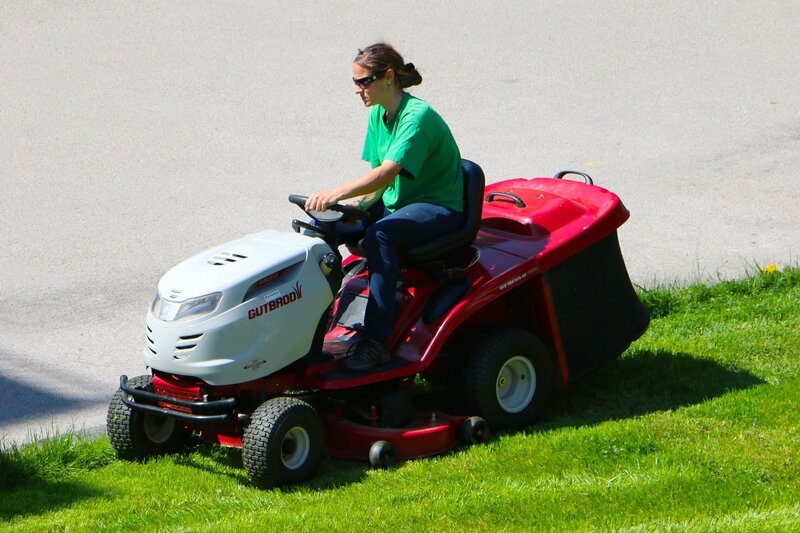 These step-up mowers come equipped with a number of comfort-and-convenience features, increased attachment options, and significantly stronger engines. For around the cost of a number of used cars, these mowers deliver the utmost technology and valuable features with the performance capacity lawn-care pros trust. There’s more to gain from owning a “California-compliant” mower than simply doing a kindness to the environment. Ultimately, you are doing yourself a huge favor. California compliance refers to the state’s unique pollution legislation geared strictly toward lawn mowers of every type sold within the regulatory California Air Resources Board’s jurisdiction. In the interest of defending public health, the state has undertaken a strict program to limit Volatile Organics Compound (VOC) emissions by commercial and industrial products. The organization oversees air-quality restrictions imposed on factories, marine activities, consumer goods, and vehicles – including riding lawn mowers and tractors. With emissions from small non-road engines accounting for up to 20 percent of pollution throughout major American cities, California established regulations specifically targeting lawn mower engine emissions and fume leakage as the most frustrating defaulters on keeping pace with carbon footprint reduction. Thus, all sale materials for every mower sold in California must contain verification of the model’s adherence to the improved standards. The good news being, any mower that can pass California’s environmental rigor will likely exceed any other state’s muster easily. The even-better news? Per engineering trends, environmentally friendly engines also tend to be phenomenally fuel-efficient. It always pays to ask about California compliance. This Wisconsin-based manufacturer has been around since 1933 making all-steel riding mowers and cast-iron gear cases as tough as any machinery around and zero-turn mowers operated with levers instead of a steering wheel. Headquartered in Moline, IL, John Deere is an institution among American manufacturers of all walks thanks to both uncompromising performance and durability and the backing of unrivaled warranties and service centers. Since emerging from Osaka, Japan in 1890, Kubota has developed two of the smoothest handling riding mowers I have ever driven thanks to their commitment to perpetually improving their signature glide steering and hydraulic deck lift designs. If it can improve the look of your lawn, Snapper has probably been making it in fine style since 1951, from walk-behind mowers, riding tractors and zero-turn mowers to string trimmers, leaf blowers, and hedge trimmers. Riding mowers are available just about wherever fine lawn tools are sold, from big-box general retailers such as Walmart to specialized home-improvement superstores such as Lowe’s, Home Depot, and Tractor Supply Company. As much as I always emphasize a hands-on impression of any machine, there’s plenty to be said for the convenience and ready access to scores of reviews found at major online retailers such as the web stores for all of the above-listed major sellers and other strictly virtual sellers like Amazon.com when it comes to an easy one-stop shop.